RED Motorsport’s Lotus Exige completed the third race of the new season on June 14th and 15th, taking place in the Touring Car Championships (TCC) of the Deutscher Motorsport Verband (DMV) at the Hockenheimring. The racing car, which Evonik (Essen, Germany) uses to test new applications, boasts a number of novel features this year including a multi-layer line for charge-air cooling. The green section of the line (see photo) has an outer layer of a bio-based polyamide, Vestamid Terra. This is the first time Evonik Industries is testing the multi-layer tube system with the bio-based plastic on the race track. Since 2007, Evonik has been testing coolant line systems consisting of multi-layer tubes of petroleum-based Vestamid under tough racing conditions. These multi-layer tubes serve as lightweight replacements for rubber hoses and reinforced lines. The MLT 8000 multi-layer tubing system has since proven its performance in vehicles worldwide. 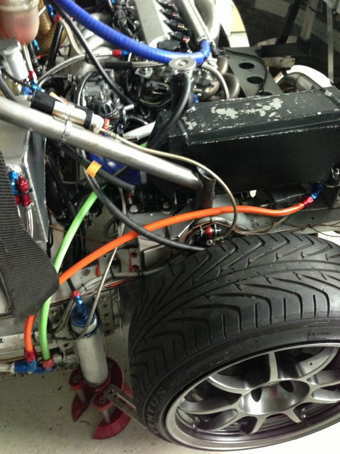 The racing car of the current season uses MLT 8000.3 with an orange outer layer. This system is around 870 g lighter than cooling line systems with steelflex tubes, which means a weight reduction of more than 70 percent. The coolant lines of the 8000 series have three layers: The inner layer consists of a polypropylene specially adapted for this application. On top of this is an adhesion promoter layer, followed by the outer layer consisting of the high-grade specialty polyamide Vestamid or the bio-based Vestamid Terra. Evonik’s bio-based polyamides have also been successful in other applications. They have been used commercially since 2010 as mono-layer tubes in, for example, air brake lines of utility vehicles, in semitrailers and trailers, and for pneumatic lines. The use of the bio-based material in multi-layer tubing systems for coolant lines is new, however. Under the Vest amid Terra brand name Evonik offers various bio-based polyamides (PA 610, PA 1010, and PA 1012) covering a wide application spectrum that are used in hydraulic lines, for example. In road vehicles these lines are connected by means of quick connectors made from a petroleum-based, glass-fiber-reinforced polyamide 12 such as Vestamid L-GF30 or bio-based Vestamid Terra HS1850. 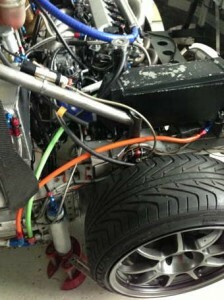 In racing vehicles, on the other hand, connection is by metal plug-in couplings. 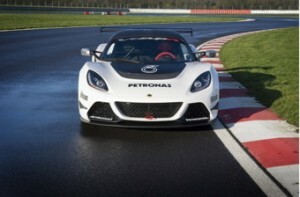 For many years, Evonik Industries has been making components specifically for the Lotus Exige to test them under the high demands imposed by motor racing. The findings flow into commercial-scale production – and not only in the automotive industry.